The Climate Warriors: Auimatagi Joseph, Brianna and Sione on their visit to the UK from the Pacific islands. 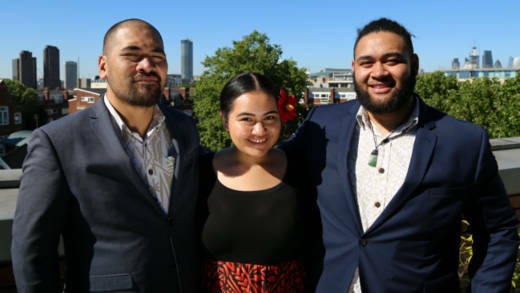 Joseph, Brianna and Sione are young climate activists known as Pacific Climate Warriors. Drawn from across the Pacific region, they represent grassroots, frontline and indigenous communities. With support from around the world they are enabling young people in their communities to get involved in environmental justice issues. The Climate Warriors are speaking up from the frontlines of this climate crisis. Things are urgent now and we too have to play our part in the response. The UK now has an opportunity to take a lead. So we are petitioning the Prime Minister to commit to a target of net zero emissions by 2045 in UK law. If the UK can reach net zero, it means we are no longer contributing to climate change. The UK was one of the leading countries on climate change at the time of the Paris Agreement, but we need to do more to protect our homes and our beautiful landscapes. Scientists have proven that we need to keep the world’s temperature within 1.5oc. This increase in global temperatures can only be limited if we control the amount of greenhouse gases we release into the atmosphere. Ask the Prime Minister to commit to net zero emissions by 2045. A clear response is needed to keep global temperatures to 1.5oc. It’s as simple as filling in your name: click here to sign the petition demanding the UK government takes action.